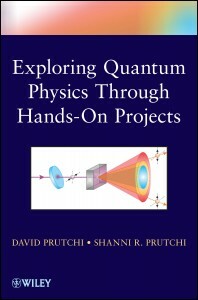 We are the authors of the book “Exploring Quantum Physics through Hands-On Projects,”which will help you understand Quantum Physics through hands-on experiments that you can conduct at school or at home! Our book will guide you in the construction and use of setups to reproduce the key experiments that have brought us to our current understanding of the quantum world. Importantly, all of the experimental equipment can be built out of relatively inexpensive materials that are readily available at the hardware store or from on-line vendors of electronic surplus. The projects range from simple measurements of Planck’s constant all the way to testing violations of Bell’s inequalities using entangled photons. The project descriptions are targeted to an audience with basic experience in electronic prototype construction. The circuits actually work, and the schematics are completely readable.